Gen Saw Mutu Say Poe—chairman of the Karen National Union (KNU)—and the Kachin Independence Organization’s (KIO) central committee—led by KIO vice chairman Gen N’Ban La—met and discussed Burma’s peace process in Laiza, the KIO’s headquarters, according to a joint statement released on Thursday. The KNU—a signatory to the country’s 2015 nationwide ceasefire agreement (NCA)—and the KIO—a non signatory—pledged “collaboration to achieve peace; by seeking the best and necessary approaches,” in the statement. Two advisers from the Restoration Council of Shan State also joined the discussion. “We urge the responsible stakeholders to work together to end the current armed conflict and to find solutions in accordance with the NCA promises and to have inclusion of all stakeholders,” read the joint statement. 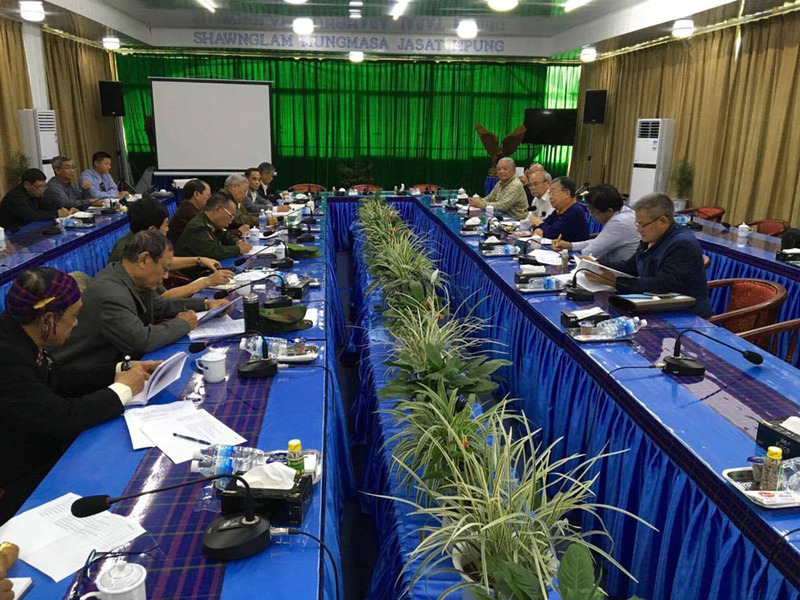 It said that none of the ethnic armed groups trying to achieve peace were “terrorist” groups—a reference to a label proposed in December of last year in the Shan State Parliament for the four-member Northern Alliance, to which the KIO belongs. The motion passed. The KIO-KNU statement said that these groups should instead be regarded as “peace partners” in the peacebuilding process. Before it signed the NCA in October of 2015, the KNU was a member of the United Nationalities Federal Council (UNFC), the ethnic armed alliance that the KIO now chairs. The KNU chairman’s trip to Laiza was planned after Saw Mutu Say Poe met Gen N’Ban La, also the chairman of the UNFC. Gen N’Ban La invited the KNU chairman after it was expressed that he wanted to meet with the KIO central committee as well as with the Kachin Public Consultative Committee, the group tasked with advising on the peace process and future political processes, said Gen Gun Maw, the vice chairman of the KIO. The KNU delegation also met with the Kachin Public Consultative Committee on Wednesday. “We also made decisions to try to create a meeting platform between the Shan, Karen and Kachin public consultative committees,” Gen Gun Maw told The Irrawaddy on Thursday. He added that the meeting had yielded positive results, as both the KNU and the RCSS is had been holding ongoing peace talks with the government and that the KIO was briefed on the developments. “It is very helpful for the whole [peace] process we are in, as we were able to mutually discuss the strengths and weaknesses as well as the requirements [of the process],” Gen Gun Maw said. The trip by Saw Mutu Say Poe to the KIO’s territory is the first such trip in recent years. Other KNU members, including secretary Saw Pado Kwe Htoo Win, joined an ethnic summit held in Mai Ja Yang—a KIA-controlled area—in 2016, and vice chairperson Padoh Naw Zipporah Sein also joined the UNFC-led consultations. KNU Chairman Saw Mutu Say Poe also reportedly met with Chinese authorities in Kunming this week to discuss China’s role in the peace process.